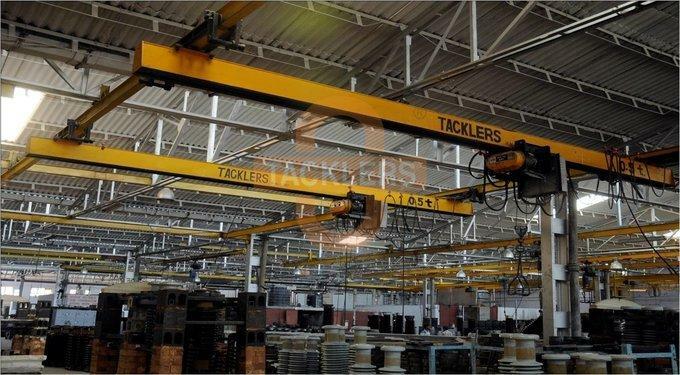 TACKLERS brand Single Girder Underslung Crane (Underhung Cranes) are an ideal solution, in places where supporting steel work under the crane is not an option. It is best used for minimized loadings, as Underslung Cranes are supported from the roof structure. Consequently most Under Slung Cranes are Single Girder design, although we offer a double girder option. Techno Industries Manufactures a standard range of Single Girder Underslung Cranes in capacities 0.25 Ton to 25 Ton. Typically, the Under Slung Cranes find their application in the motor vehicle and aerospace industries where the production process demands a large clear area. However Underslung Cranes can be used appropriately in many other industrial processes as well.